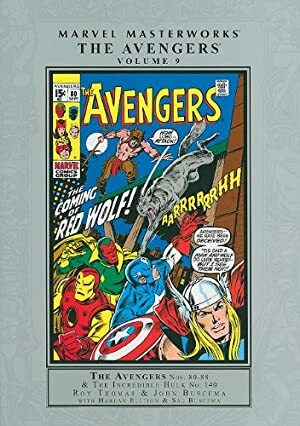 The Red Wolf is an obscure Marvel Comics super-hero legacy – that is, a number of persons through history have adopted the Red Wolf identity to fight the good fight. 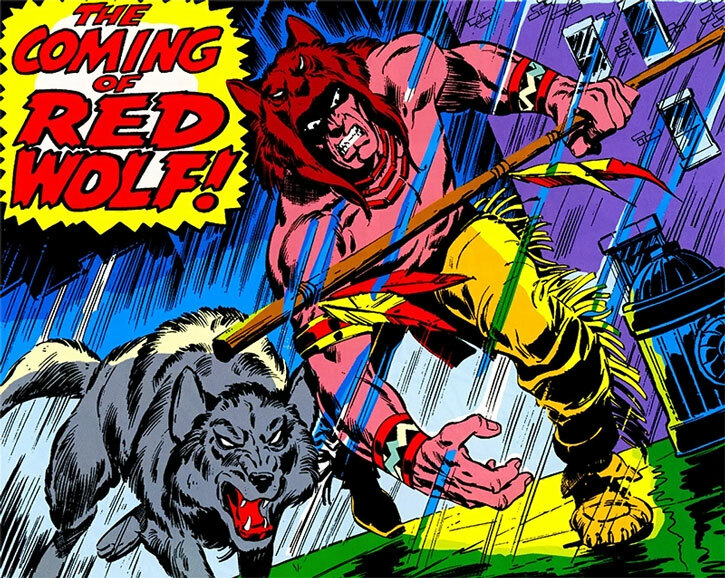 *This* Red Wolf is the one who appeared in 1970, though there have been various rounds of modernisation to correct awkwardly dated depictions of Native Americans. This profile is a bit old so it’s not encyclopaedic (and I think Marvel has made a few retcons since) but heh, an efficient review of a character’s basics is a good thing too. Real Name: William Talltrees aka Thomas Thunderhead. Known Relatives: Thomas (father, deceased), Rebecca (mother, deceased) William (uncle). 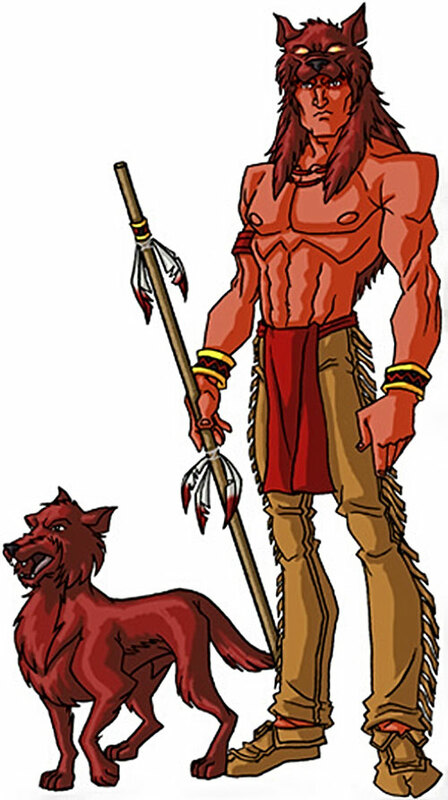 Red Wolf is the avatar of Owayodata, a (fictional) Native American Wolf Spirit. He has superhuman speed, reflexes, strength and endurance. All of his senses have been heightened to preternatural levels. Even before his transformation he was a highly skilled combatant, and was a successful skill-based hero for many years. Over the centuries, the Cheyenne Indian god Owayodata, the Wolf Spirit, has inhabited various humans. His goal was to see both that the tribe prospers and justice is always triumphant. In the modern era, Will Talltrees, son of Thomas Talltrees, a Cheyenne tribal leader, grew up on a reservation hearing tales of the Red Wolf from the spiritual leaders of the tribe. Once he reached adulthood, Talltrees left to enlist in the US Army. During his time in the Army, he allowed his fellow soldiers to destroy a village in Việt Nam and let a young man fall to his death from a helicopter. After serving his time, he became a construction worker in NYC. Returning home, Talltrees witnessed his father being intimidated into selling his property by a corrupt businessman, Cornelius van Lunt. That night, Talltrees became the sole survivor of the massacre of his family at the hands of Lunt’s henchmen. Swearing vengeance, Talltrees donned the ceremonial garb of the Red Wolf kept by his tribes spiritual leaders. He then performed a ritual dance he had witnessed in his youth. He was visited by Owayodata and imbued with the god’s spiritual legacy. Talltrees also soon found a wolf cub that he named Lobo. He trained Lobo to be his companion, as in the legends of the previous Red Wolves. Stalking van Lunt back to NYC, Red Wolf exacted vengeance from him with the aid of the Avengers. Upon his return to the southwest, he began his career as a masked vigilante and champion of freedom. Red Wolf was one of the heroes of the American Southwest to respond to a distress call from Rick Jones to rescue the Hulk from the Corruptor. This event led to formation of the loosely organized group the Rangers. William Talltrees faced his past in the desert and was almost found wanting. The boy who fell from the helicopter came back as a character called the Bengal to avenge his family’s death against Talltrees. Lobo was killed in the fight and Red Wolf was critically injured. Owayodata visited Talltrees as the doctors operated on him. He forced the hero to confront and conquer his guilt. The Wolf Spirit then granted him enhanced powers to aid him in his fight for justice. Later on, wile meditating in the wilderness, Red Wolf heard gunshots and investigated. He found joyriders having target practice with a mother wolf and her cubs. He stopped the men, but stayed his hand from further violence as he picked up the only surviving cub. He has started training this cub to become the new Lobo. More recently, after the Civil War, the Texas Rangers have become the official, registered super-team in Texas. All members have Credentials (Initiative, Low) and access to Extensive Headquarters as members. The Rangers were the first line against a massive HYDRA attack targeting the POTUs’ private residence in Texas. They were defeated, but bought enough time for the rest of the Avengers to arrive. When the Secret Invasion started, it was revealed that Lobo, Red Wolf’s companion, was an infiltrated Skrull. They fought against him, until Shooting Star killed him. Texas Twister and Shooting Star joined with both the Initiative and the Skrull Kill Krew in the final combat in Fort Hammond, where the blonde Texan was apparently killed by lethal gas. Red Wolf is a tall Native American of Cheyenne heritage . Early in his career (illo on the bottom) he went shirtless, wore buckskin leggings, moccasins, red loincloth, wristbands and arm band on right arm. He wore a wolf’s head cowl. Currently (illo on the top) his costume has the addition of traditional Native American war garb. Red Wolf is a stern no-nonsense type of hero. In a fight, he prefers to get the job done as quickly and efficiently as possible, with no wisecracks or extra remarks. He takes his job as Owayodata’s agent on Earth very seriously. He tries to act as a link between the old Indian ways and the modern world. See Texas Twister’s write-up for information on the Ranger’s in the DCU. As for Red Wolf, his role wouldn’t change on DC earth as the Champion of his people. An interesting foe for him would be Black Bison, as their goals are completely contrary. Avengers (Low), Black Crow (High), Dr. Strange (Low), Rangers (High). MIA (Heralding Indian Nations into the modern world), Secret Id. Bow & arrows [BODY 4, EV: 03, Range: 08]. Coup Staff [BODY 05, EV: 04 (09 w/STR)]. Knife [BODY 05, EV: 03 (9 w/STR)]. Spear [BODY 04, EV: 04 (9 w/STR)]. SMALL SHIELD [BODY (Hardened Defenses) 06, EV 02, Recommended STR 02, Note: OV/RV bonus when using the Block Manoeuvre is 1 AP, Note: the OV bonus for the Shield Cover Manoeuvre is 1 AP]. Tomahawk [BODY 06, EV: 04 (9 w/STR)]. His Motivation was Seeking Justice.